Sorry for the lack of posts the last few months. Wedding planning has seriously become my second job! But I promise you that I have an arsenal of recipes I am ready to unleash, and will do my very best to make it more often that not. Now that I’ve apologized, let’s move on to one of my favorite recipes to date! One of my favorite snacks (meals?) is the chicken lettuce wraps from P.F. Changs. I’ve had them at other restaurants, but none seem to compare… until now. I was shocked at how authentic, yet easy this recipe from Kalyn’s Kitchen was. It is the perfect weeknight meal to make when you want to cut out carbs, but don’t want to give up on a flavorful meal. I adapted my own version of the recipe, replacing the peanuts with water chestnuts and adding crispy rice noodles. 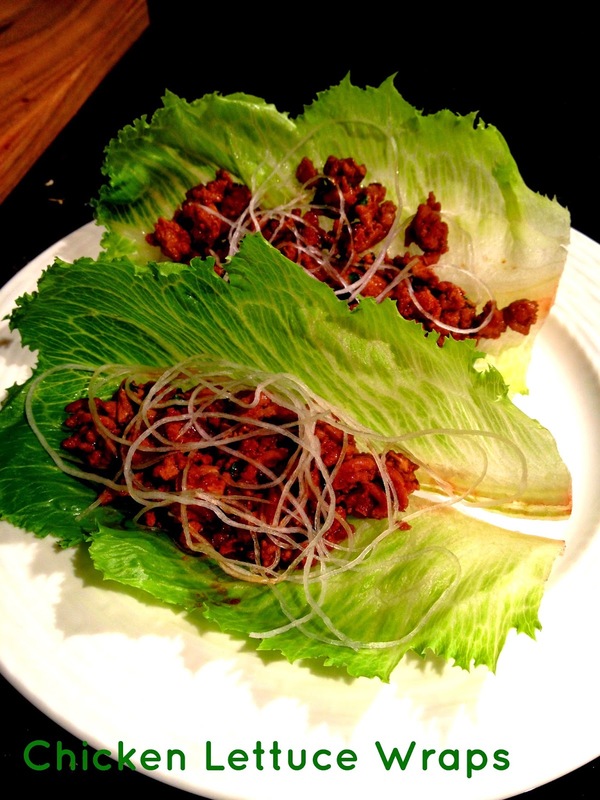 To me, the crispy rice noodles are a must; they really add so much depth to the wraps. Also, you will see below in my ingredients list that I use a pre-packed bunch of romaine/iceberg lettuce leaves from Wegmans … yes, I am a cheater. But if you don’t have a Wegmans near you, I would recommend either using iceberg lettuce leaves or Boston bibb lettuce if you want something with more nutritional benefits. Chop up all shallots, garlic, water chestnuts and cilantro and set aside. Heat the vegetable oil in a large non-stick frying plan, adding the shallot/onion and sauté for about 2 minutes. Add the garlic and ginger and sauté for about one minute more. Add ground turkey, breaking apart as it starts to cook. Then add soy sauce, chili garlic sauce, fish sauce and water chestnuts. Cook until the turkey is brown and crumbling and the sauce is slightly reduced, about 5 minutes. In the meantime, follow the instructions on the rice noodles package and prepare accordingly. While the turkey cooks and the sauce reduces, prepare your lettuce cups for serving. Once the turkey is done, add the chopped cilantro and cook 1-2 minutes. Serve all components of the meal in separate dishes allowing each person to assemble themselves.